I would like to briefly introduce our brewery and explain some of the technology of the Ferdinand Beer production. To start with, let me introduce myself. My name is Jaroslav Lebeda and currently I work as a brewer and production manager for the Ferdinand Brewery. After graduation from secondary school of engineering and food–processing I started to work in the brewery, where I have worked since 1989. During this time, I have gained experience working in all departments of the production and have applied this experience In my current role. Let‘ say the beer industry is more than familiar to me. Regarding the history of the brewery I would like to mention the year 1897, when the archduke František Ferdinand d‘Este built the malt plant and the brewery, which - with only minor modifications in technological equipment – still operates today; We are also proud of the fact that we are a genuine Czech joint-stock company with no foreign participation which makes us truly local. The brewery produces approximately 25000 hectolitres of beer per year. We have altogether five types of beer ranging from non–alcoholic to special types. Our business policy is mainly focused on the domestic market and in the further the export markets. The beer production starts from an original recipe for brewing which uses Czech malt which we produce ourselves and Žatec hops, we use traditional technology with open bottom fermentation and further lagering/maturing in a beer–storage cellar. Under no circumstances do we use modern methods of beer production, especially the CK tanks; nor do we adulterate the beer to acquire certain alcohol levels. We have tried to respect and keep to the traditions which our predecessors left for us. This brings a deep sense of commitment and, above all, responsible and honest hard-work from all employees who participate in the Ferdinand beer production. Our beer should be noted for its full bodied taste, harmonious scent and bitterness, which is ensured by the highest quality Žatec hops . The strong vigour and high frothing quality – that is the result of a sufficient period of fermentation in the beer–storage cellar. The brewery produces high quality beer and the word “real” in our trade-mark is not just a cliché. This Czech beer celebrates the ancient technology and skills of the brewers from Benešov. 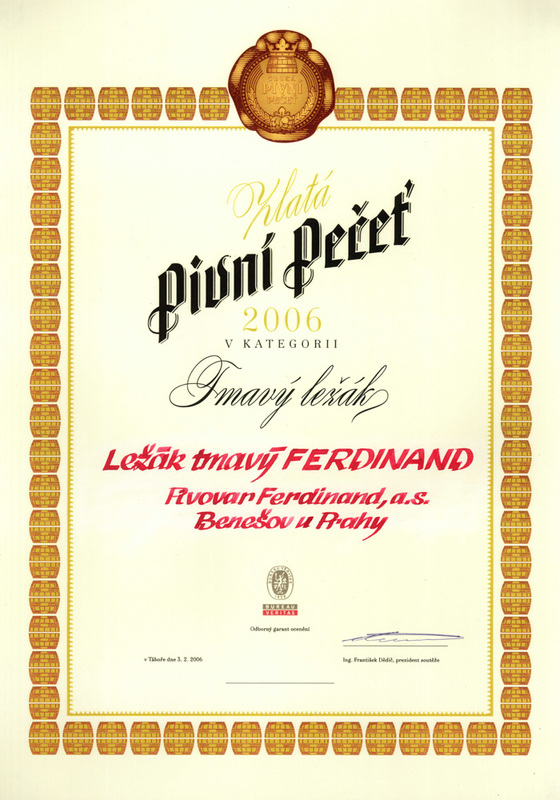 We have chosen to do things the right way, which is acknowledged by the fact that Ferdinand Brewery attains prominent positions in tasting competitions. Enjoy the taste and freshness of the Ferdinand Beer, which is characterised by its golden colour, sparkling clarity, strong vigour, full bodied taste, intensive bitterness and high froth! 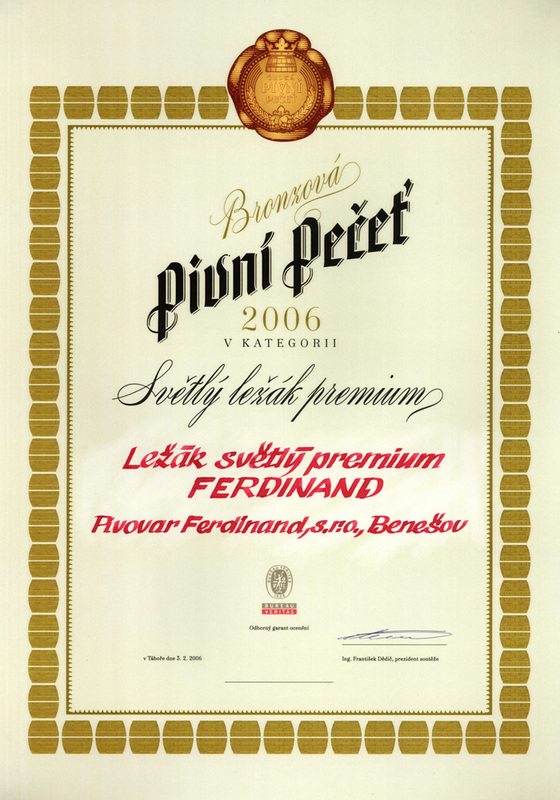 WE believe that our “real beer” Ferdinand will always be your first choice for taste and quality. We look forward to our future,successful cooperation.